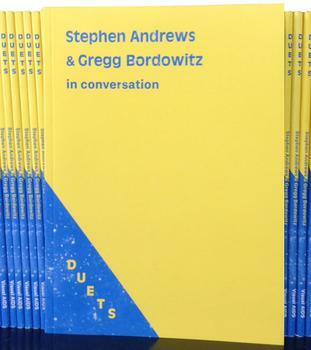 Gregg Bordowitz speaks to longtime friend and Visual AIDS artist member, Stephen Andrews about painting, poetry, cosmology, and survival. Stephen Andrews is a Toronto-based artist know for making artworks that mediate between analogue techniques and mass-media imagery. Gregg Bordowitz is a writer and artist living in New York. He is also the director of the School of the Art Institute of Chicago's Low Residency MFA Program. DUETS is a series of publications that pairs artists, activists, writers, and thinkers in dialogues about their creative practices and current social issues around HIV/AIDS.